Paper whites (Narcissus papyraceus, a sub-species of Narcissus tazetta) are popular indoor plants for winter and the holiday season. Unlike other narcissus, paper whites don't require a chilling period, so forcing them is almost as easy as putting the bulbs in water and waiting. The fragrant flowers bloom within about 3 weeks of planting, for almost instant gratification. Select a container that is about 3 - 4 inches deep (8 - 10 cm) and that has no drainage holes.You won't be adding soil and you do not want a container so deep that the bulbs will be completely submerged. Spread an inch or 2 of stones, marbles or even gravel, along the bottom of the container. Whatever material you choose, it should be clean. Position your paper white bulbs, pointed end up, on top of the stone layer. Go ahead and squeeze them in tightly. They not only look better in a large group, the tight fit will help keep them from toppling over. Add another layer of stones to fill in any gaps and cover the bulbs up to their shoulders. The pointed tips should still be showing. Do not bury the bulbs completely. Check your bulbs daily to see if they need more water. You want the level to remain just touching the base of the bulbs. They will slowly uptake some of the water and you will lose some to evaporation, but you shouldn't need to add copious amounts of water. When you see roots developing, it is time to move the container to a sunny window. The sunnier the better, but try not to let them get too warm or they’ll grow leggy. Most windows are a little cool in winter, so don't be afraid to get them close to the windowpane. Once the plants flower, they will last longer if moved out of direct sunlight, to a cool spot with indirect or diffused light. If you keep your house warm, your paperwhites will last longer if you move them to a cooler room when you are not home, and then move them back to your living area, to enjoy when you are home. Paperwhites have a distinct scent. Some people find it pleasant, others find it odd. 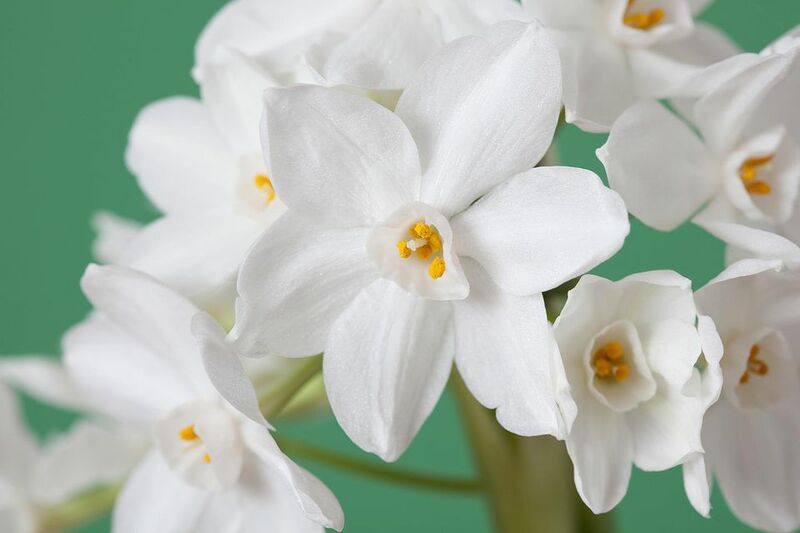 If you notice an unusual fragrance in your room, check to see if it is coming from your paperwhites.